[Whitehall Evening Post or London Intelligencer (London), February 24, 1759]. Baltimore, in Maryland. Aug.20. 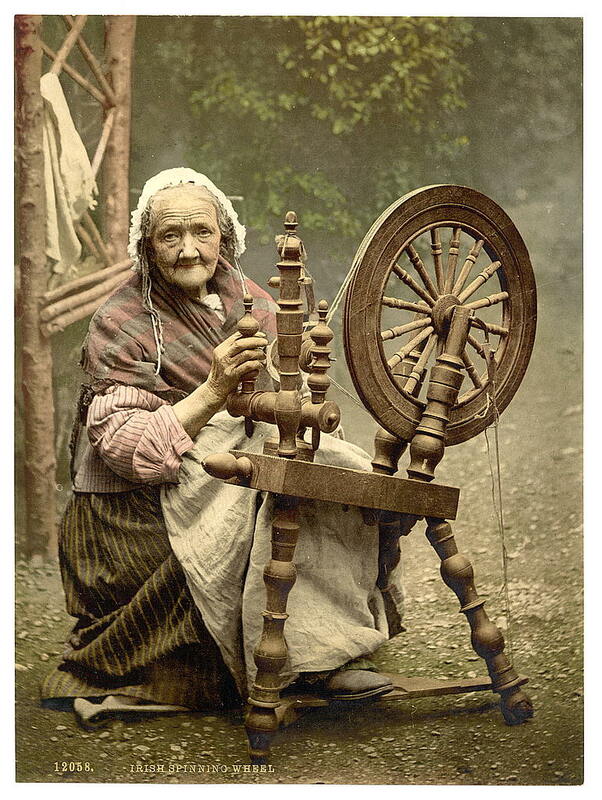 We hear from Accomack in Virginia, that lately died there Mrs Eleanor Spicer, aged 121 Years, who retained her Senses and Memory to the last, and worked at her Spinning-Wheel till within six Months of her Death. She never drank any type of Spiritous Liquors. Inquest Before Mr Smith, Coroner. And on Thursday, at Hallow, on the body of a poor woman, of the name of Martha Myddleton, who dropped from her chair whilst working at a spinning-wheel, and instantly expired. Verdict: Died by the Visitation of God. There is now in the possession of John Abbott, of Follifoot, near Knaresborough, a cat , which is possessed of faculties unknown by any Grimalkin that we have seen or read of. This domestic tiger…can easily open or fasten any door of the cottage, in a manner astonishing to behold, by actually climbing up and placing its foot in a peculiar manner on the latch; but what is most wonderful, Mrs Abbott, who is the last remnant of the olden time residing in that village, occupies some portion of her time in spinning, to which the puss lends all the assistance in her power , exerting her utmost in the carding of the wool, and, when her mistress will allow, will rattle about the ‘spinning wheel’ in a manner that would bring the ‘blush’ on many of our modern female cousins, who would find some difficulty at least, in competing with this self acquired performer on the spinning wheel. 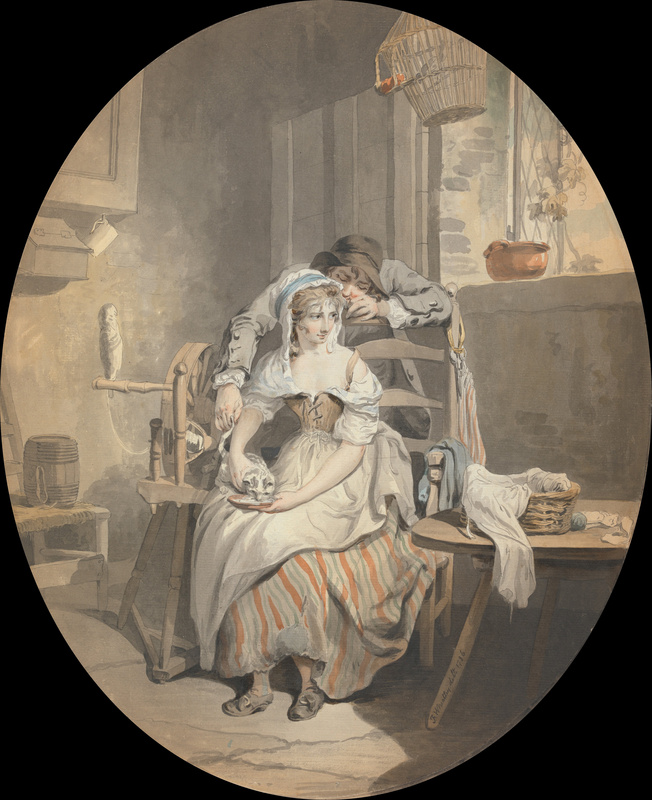 In the 1841 Census, John Abbott was down as ‘Ag Lab’, in 1851, ‘Cordwainer’; born in Follifoot, in 1773, and married Mary Midgeley on 5th August, 1800 at Spofforth. She was born around 1781, also in Follifoot. At first I assumed the article was talking about an elderly mother, but there is none living with them, the same month as the article was written, in 1841. So I am guessing the relict of a byegone age who still spun, was Mary herself, a not entirely ancient 60 when the article went to press. A Lady lately died at Cleveland in her 100th year, who could card faster than any woman could spin. We believe there are very few old ladies who do not excel more at cards than spinning wheels. [Diary of Joseph Rogerson of Bramley, woollen mill-owner]. NB: If scouring raw fleece for the first time – read this right through before starting. Wool washing (or “scouring” as it’s more commonly called) is a fine art. Here is just one way to do it. One of many – and all of them work, if you take care over some crucial steps. Recently, I was lucky enough to get a rare Boreray fleece, from Millfields Rare Breeds, in Essex. Boreray is designated as “critically endangered” by the Rare Breeds Survival Trust. Around 300 Boreray ewes are out there – probably slightly more, in reality, including the original feral flock on one of the islands of St Kilda. In Nola & Jane Fournier’s 1995 book, “In Sheep’s Clothing”, Boreray was the only breed of sheep described that had no accompanying picture, and the description a scant one paragraph – so little was known of Boreray. In “The Fleece and Fiber Sourcebook” by Deborah Robson and Carol Ekarius (2011), there is a full and fascinating entry on the Boreray; reflecting the fact we now know more about it. Basically, every Boreray in Scotland and England currently descends from one of six sheep brought from a reserve flock left on the island of Boreray when the residents of neighbouring Hirta were evacuated in the early 1930s. Hirta’s story is told in the moody and magnificent Michael Powell film, “The Edge of The World” (1936). If you buy or rent the film, you can see the native sheep, some knitting and some great 1930s’ traditional jumpers as well as enjoy the cracking good plot. Within one fleece. you may find a whole range of different fibre types – from kemp and hair to the finest 17.9 micron wool. I chose the Boreray to scour so I could promote this critically endangered breed. But also because an entire fleece is only 2 – 3lbs, so I could realistically scour the entire fleece in one afternoon. Above and beyond that, the fleece showed such a variation of fibre types, that I had no intention of sorting it before scouring. This is very rare for me. But makes it more straightforward for me to show you how I go about scouring an entire fleece. Normally, I would sort it first then wash the different grades separately. No need with the Boreray. The first Boreray I saw was millspun, from Blacker Yarns. This was made possible by the Herculean efforts of Jane Cooper, and for all things Boreray, you can do no better than visit Jane’s blog. So. Scouring wool. Whether you are scouring the rarest fleece in Britain, or the freebies given you by a local farmer (my coalman who was also a farmer once offered me an entire flock’s fleeces – for free! So I know it happens…. )… you need to know how to get it clean. There’s a couple of things we want to avoid. Firstly, shrinking the stuff. Secondly, felting it. Bear this in mind all along. Decisions, decisions! What soap/detergent to use? I have had good results with: washing up liquid, shampoo, old fashioned soap, soap flakes, and synthetic detergents such as Woolite as well as generic supermarket brands. One of my favourite brands to use is Ecover Delicates. However I had none to hand so I grated some Marseilles soap. How much soap/detergent do you need? Plenty. Put in what you think is a lot. Then a bit more. It is better and easier to scour with soft water but if, like me, you have none available then make sure all your soap/detergent is dissolved, before you start. And it will damage the wool, longterm, if you don’t rinse it out thoroughly. My Boreray came in a pillowcase. This has been how I store washed wool, for years, so that will come in handy, later. This is the fleece unrolled, tips uppermost and shorn ends to the ground, same as I do for woolsorting. The old sheet underneath means I don’t add lawn mowings or other detritus to my clean fleece. This came to me either exceptionally clean, or well skirted, not sure which, as there was minimal sheep muck on it. My first job before scouring a fleece is normally to skirt off the sheep muck, or anything too alarming. The poo-covered locks of fibre are called ‘dags’. Anyone who watched ‘Neighbours’ in the 1980s, now knows why they called some people “daggy”… Bit harsh. Dags go, wool and all, into an old watering can. I don’t bother with this wool at all as a rule but as this was The Holy Boreray, I did set aside some daggy but really nice quality locks, to be washed extremely thoroughly, avoiding wastage. This was a nice, clean fleece though, with minimal wastage. I left that to steep a couple of days then it is a handy plant feed. (Not used on anything I am growing organically, just in case, but it’s fine on the roses or border flowers). Now for some more soaking. I wash about 1lb at a time. In the case of this fleece, I wasn’t doing any wool sorting prior to scouring, so I simply divided it into quarters, then dealt with a quarter at a time. As you can see, I scour in those cheap Rubbermaid style plastic buckets, that hold quite a few litres. The more water you use, the better. This first dunking, has no detergent or soap – just plain water. That is because this will lift out a fair bit of the crap, and then that can go straight on your garden, with nothing harmful to your plants. Water temperature, very hand hot. Just about that point at which you need to wear gloves. If water is too cold, the scouring won’t work as well, as you have to dissolve both muck and the lanolin to get wool clean. It only dissolves above a certain temperature and sets back on the wool if your scouring bath gets too cold. So you don’t need to hang about. This soak lasts about ten minutes. I have, in the past, soaked overnight with no ill effects. But ten minutes will do it. If you are conserving water/water heating costs, then you can set up a system with a couple of buckets, and then soak the second pound of wool in this same water. So that is another decision upfront – do you aim to wash just 1lb of wool or more than that in one go? If the latter – are you going to recycle the water from the first batch for the second? I do this all the time, with the proviso that the second batch gets one final extra rinse in clean water, at the end. Works for me, but I can’t guarantee anyone else’s results. A word of caution. If you want to shrink wool, then agitate it with soap or change the temp of the water from one scouring bath to the next… Ie: if you don’t want to shrink wool, then make sure the water temperature of each dunking matches the previous water temperature. A rapid changing from hot – cold or sudden agitation of wool will shrink and/or felt it. Another Very Bad Thing To Do is to let the wet wool take its own weight, when full of water. So support it with something like an old colander or do the whole process in one of those laundry bags, if in doubt. Never let wet wool take its own weight – this goes for drying too. Support it well. I often wash and rinse with the 1lb of wool in the colander, throughout. Now let that drain on your lawn or wherever, whilst you sort out a hot tub of soapy/detergenty bubbles. Making sure this is the same temp as the previous lot of water. Gently submerge your supported wool into the bath, and if you need to work at any obvious stain or dirt, do so gently, under the surface of the water, so you are not agitating the fibre in the air, which is a surefire way to get it to felt. I leave this to soak for another 10-15 minutes or so. Then, again, lift out in its laundry bag or colander, drain and… rinse. Once again, pay attention to the exit temp of the previous bath and try to match it, so you aren’t shocking the fibre. Now is a good time to decide whether the fleece merits a second scouring or not. I decided not. But then I like to clean wool enough to make it pleasant to work with, but not so much I strip out all the natural lanolin. That is a fine art and hard to put into words precisely how I judge it, but a fleece that presents at the start with very little vegetal matter or dags, or problems, is most likely only to get one scouring from me, at the start. I want my yarn to be clean though, and not abraded from within by particles of stuff the sheep has rolled in, left in it so as I say, it is a fine judgement call you have to make, between scouring once or scouring more than once. I usually make this decision after the first rinse – if it doesn’t look clean enough, I will scour a second time. Same drill again – consistent slightly-above-hand-hot temp, no agitation above the surface of the water, and leave to soak for 15 minutes or so. Then rinse. With experience, you can scour a fleece well, but leave in enough of the natural oil to help you out when spinning. Repeat this rinse at least two or three more times. Until the water runs clear with no more sign of detergent or soap. Continue to pay attention to levelling the temperature of each bath with the temp of the water at the point the wool exited it, before. When the wool is clean and no longer has any sign of being soapy – time to dry. Again, make sure its weight is supported. I like to MacGyver a wool dryer, using an old clothes airer with either muslin or an old sheet clothes-pegged across it. This then takes the weight of the spread-out wool. You can put the wool in a clean pillow-case and whizz it through the spin only cycle of your washing machine. If you are brave and/or foolhardy. I just daren’t risk it with this fleece but have done it with cheaper/free ones with no ill effects. In ‘The Pennine Weaver’ (1971), Phyllis Bentley – august Yorkshire writer and friend of Marie Hartley and Joan Ingilby, writers of ‘The Old Hand-Knitters of the Dales’ – describes the wuzzing skep; a basket on a rope, you put the wool inside, then whizz around your head, using centrifugal force to spin dry the wet wool. I would make myself one – only some ridiculous injury would ensue, knowing me, and I can imagine that on my medical notes – the first person in 200 years to be knocked out by a wuzzing skep…. I leave you with a shot of my cat, Helen, The Tripod of Evil, (18 this year), making a beeline for the ‘ripe’ fleece. Now it is scoured, she has no interest in it whatsoever.